Base class for ELF file sections. Definition at line 8769 of file binaryInstruction.C. Constructor for sections not yet in a table. This constructs a section that is in neither the ELF Section Table nor the ELF Segment Table yet, but eventually will be. Definition at line 8825 of file binaryInstruction.C. Initializes the section from data parsed from the ELF Section Table. This includes the section name, offset, size, memory mapping, and alignments. The id is the index into the section table. 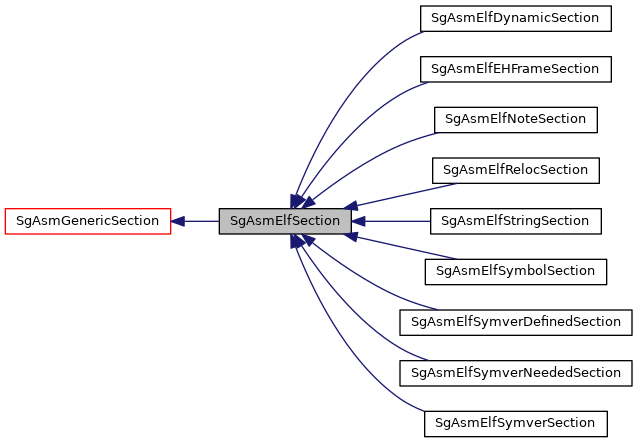 This function complements SgAsmElfSectionTable::add_section in that this function initializes this section from the section table while add_section initializes the section table from the section. Initializes the section from data parse from the ELF Segment Table. This is similar to init_from_section_table but for segments instead of sections. Returns info about the size of the entries based on information already available. entsize is the size of each entry, sum of required and optional parts. This comes from the sh_entsize member of this section's ELF Section Table Entry, adjusted upward to be large enough to hold the required part of each entry (see "required"). required is the size of the required (leading) part of each entry. The size of the required part is based on the ELF word size. optional is the size of the optional (trailing) part of each entry. If the section has been parsed then the optional size will be calculated from the entry with the largest "extra" (aka, optional) data. Otherwise this is calculated as the difference between the entsize" and the @p required" sizes. entcount is the total number of entries in this section. If the section has been parsed then this is the actual number of parsed entries, otherwise its the section size divided by the entsize. Return value is the total size needed for the section. In all cases, it is the product of entsize and entcount. Base implementation for calculating sizes. entsize is size stored in the ELF Section Table's sh_entsize member, or size of entire section if not a table. required is the same as entsize. entcount is the number of entries, each of size entsize, that can fit in the section. The return size is the product of entsize and entcount, which, if this section is a table (nonzero sh_entsize), could be smaller than the total size of the section.